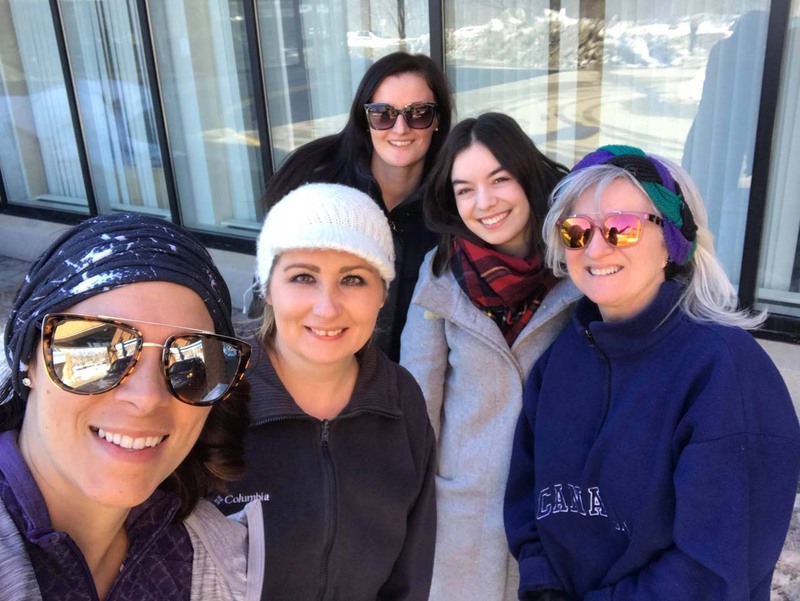 The Northern Cancer Foundation and Health Sciences North Foundation have been going out at lunch for their Lunch-Prep Training Program for the SudburyROCKS!!! Marathon - For the Health of It! Huddle’s most outstanding season came in 2010, where she progressed from breaking 15 minutes in the 5,000m for the first time to going on to run 14:44.76 to set an American Record. While in college she tied the late Ryan Shay for a Notre Dame record for a career total of nine career All-America honors. Huddle has been turning heads in the distance running world since her days as a high school standout winning national meets and even setting a national high school two mile record of 10:01. She did not run cross country until her senior year of high school. Her school did not have a cross country team, so she ran as a one-runner team coached by her father. She was undefeated during the regular season, set 12 course records and finished fourth at the 2001 Foot Locker Nationals. Huddle is a huge Oprah fan and rarely missed an episode prior to the show going off the air. Paints her fingernails a different color the night before each race. Married to Canadian middle-distance runner and former Notre Dame teammate Kurt Benniger. We just got back to Canada last night, figured I would write a little blurb about my latest experiment with the marathon! I am waiting for photos from Marathon Photos and can send one or two when they are ready. I registered for the Barcelona marathon sometime last fall hoping it would motivate me to keep running in the winter and would be an opportunity to stay qualified for some other runs i.e. Boston. It quickly turned into a recreational, enjoy the sights marathon. I discovered that there is no such thing as a recreational marathon. Barcelona is a lovely city. The marathon was very well organized, start line incredibly easy to get to on the city's subway system, and the festive crowds were abound on the course. The marathon itself had around 17,000 runners! At the start line I was surrounded by folks who thought nothing of the very balmy 9 degree celsius weather at 8:30am. Many people were adorned with winter running gear. At 9 degrees, having forgotten to apply my sunscreen didn't seem like such a big deal. The race, like most marathons, started off not too bad. I was feeling good, not looking to pull off anything crazy but thinking maybe I'd surprise myself like I did in Boston. Fast forward to a time about 1.5 hours later. At this point I had already accidentally caught up to the 3:30 pace bunny and lost them again. The sun was starting to rise, and I was starting to think maybe I should try to run a bit more conservatively. By kilometer 18, the sun has me finding any bit of shade I can find while I contemplate the meaning of life and the choices I made leading up to the marathon. We hadn't even come to the stretch of the race that has us running along the beautiful beaches of Barcelona with nothing but a few palm trees to provide shade. Around kilometer 34 there was some walking to try to ease the pain, but I have discovered that it doesn't feel much better. I was glad to see the finish line- burnt, hurting, and ready to see the rest of Spain. I would recommend the run to others. 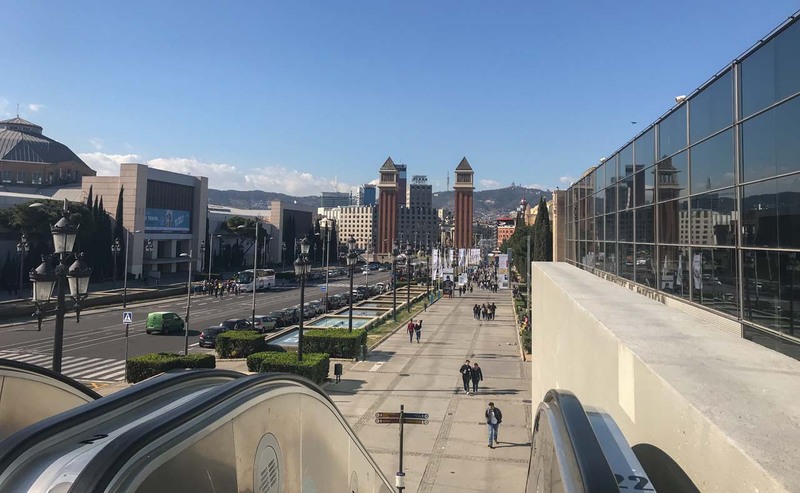 No better way to enjoy the monuments of Barcelona than with a little 42.2 km stroll! Unofficially, the Lo-Ellen Park Knights can lay claim to boasting the top high-school nordic ski program in the province. Unofficially, only because there isn't actually a banner that reflects the overall aggregate totals from two complete days of racing, earlier this month in Duntroon, one that encompasses both the open (club skiers) and high-school athletes that are participating at both the junior and senior levels. Officially, the haul of hardware that came north was incredibly impressive. Both of the Lo-Ellen senior teams walked away with the championship banners for their respective divisions, again from an aggregate standpoint. 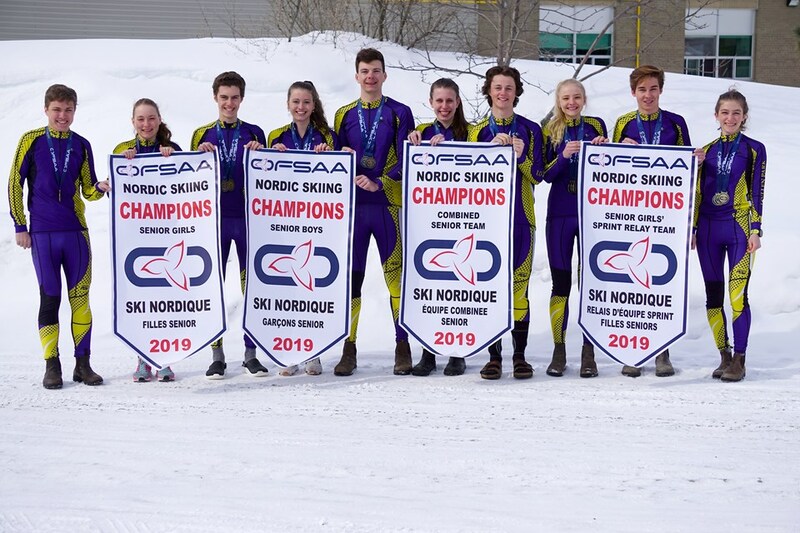 The Junior teams finished second as the overall Knights' resume bested long-time nordic powerhouse schools such as Glebe Collegiate Institute in Ottawa and Collingwood Collegiate Institute, both of whom field teams that are ripe with club skiers from Nakkertok, Hardwood and Highlands Nordic ski clubs, the premier venues for the sport in the province. Individually, the noteworthy Lo-Ellen results would fill a good sized scrapbook. Joining the Lo-Ellen contingent in cracking the top 25 was Sacré Coeur Griffons senior girls racer Danica Levesque, sliding in to 22nd place in her event. That said, this meet clearly belonged to the Knights. Not that this shocked Alex Lambert, an Elliot Lake native who lists the triathlon as his first and foremost passion. Transferring to Lo-Ellen and living with his grand-parents as he completes grade 10 this year, the young athlete who is clearly predisposed to distance competitions immediately took stock of a far different prevailing attitude in the school that he now calls home. 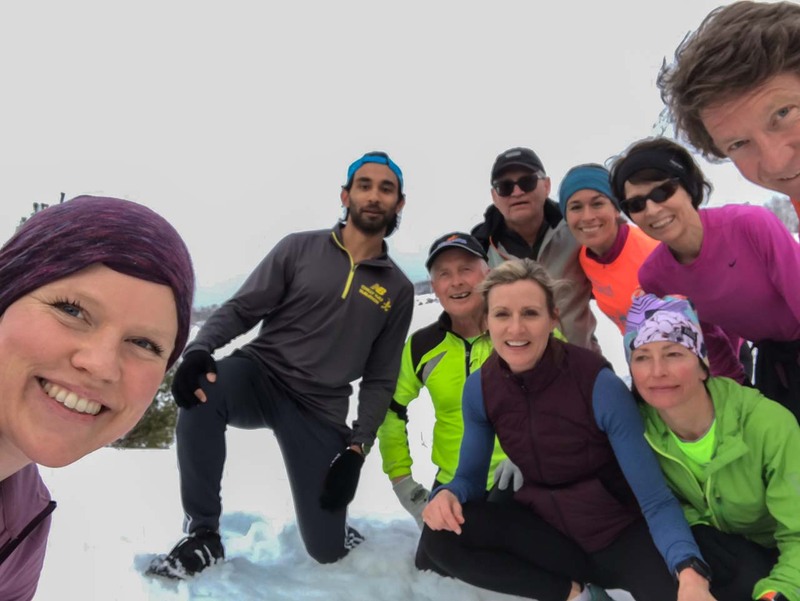 "They all seem very into the sport here, compared to my previous school, where we had a couple of cross country runners who would participate," said Lambert. "They actually take it very seriously here. It's definitely a lot more motivating - you want to work really hard to get better." 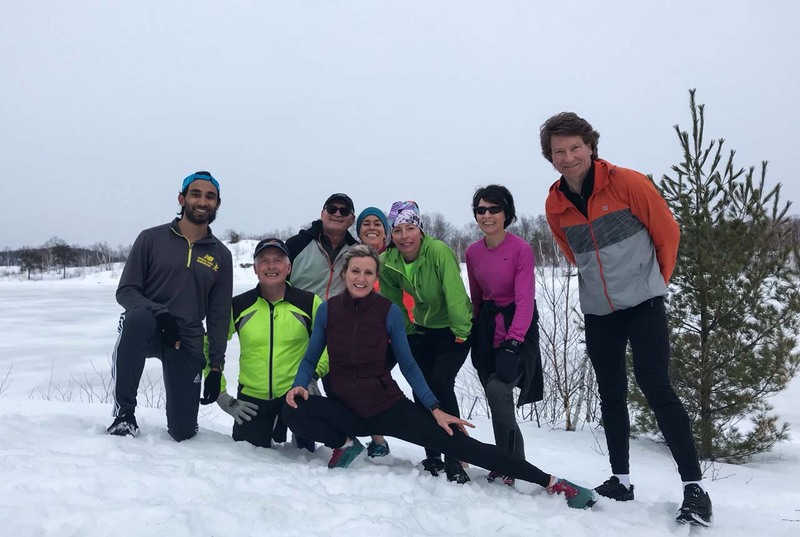 With distance running already a key component of his skill set as a triathlete, Lambert focused largely on the same transition that so many of his new teammates encountered once the snow hits, sliding over from cross-country season to nordic ski. "I had to adjust to the different forms that you have to use, and knowing what to use based on the difficulty of the course," he said. "Going up a hill, you use a different technique than you would on the flats. Running is the same technique the whole time." Now three years into a sport that he currently practices in the more competitive club environment, Kendyn Mashinter can relate to exactly what Lambert is experiencing. "The first couple of weeks of skiing, my arms are sore," said the 17 year old grade 11 senior. "The arm movements are different, and there's also different strides in skiing." And for as much as he and his fellow Knights have now taken their rightful place among the very best high school cross-country running teams in Ontario, Mashinter knows that there is a slightly different mindset as they make the move over to nordic in December. "There is less pressure in skiing for the races," he said. "They're a little more low key, generally with less competitors, and more competitors that are new to the sport." Still, he sees his complementary sporting passions as an absolute must as he looks to decide on his post-secondary options, and well beyond, for that matter. "I definitely want to do something with either running or skiing beyond high school, but I'm not sure which one - maybe both," noted Mashinter with a laugh. "Nordic ski and running are sports that you can do for life. It's not like you need a team to do it. I see myself doing it my entire life." These are quotes that would have been every bit as applicable if 16 year old grade 11 star Meredith Kusnierczyk had spoken them. 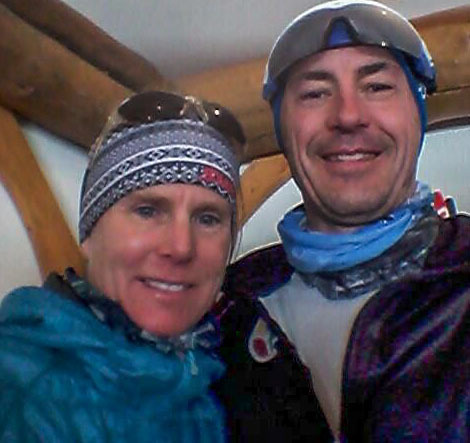 "I love nordic ski, but cross country running and skiing are very close for me," she said. "I can't say that I prefer track as much, just because it gets very repetitive running seven and a half laps around the track. I like the different terrains with cross country - it's really pretty on some of the courses." 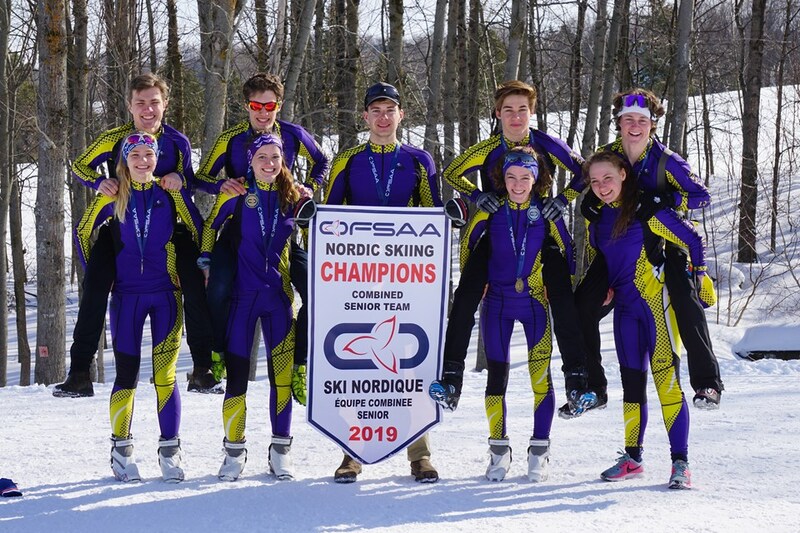 While there has been a legacy of OFSAA nordic success, in recent years at Lo-Ellen, the team would have been challenged to lay claim to being #1, overall, at the meet, until this year. "I think we thought we had a chance at doing as well as we did, but I wasn't expecting it," said Kusnierczyk. "We didn't want to get our hopes up too much." Turns out their wildest dreams were very realistic, as the Knights were arguably even more dominant when it came to the relay races on Friday. While Colin Ward once again led the Knights coaching staff this year, he was quick to share the accolades with a large handful of key assistant coaches, including Neil Phipps, Sara McIlraith, Bridget Spoel, wax technician Robert Wiss, and coach/manager Vanessa Cato. Also representing Sudbury with a great deal of pride was the local para nordic duo of Audréanne Soenens (Macdonald-Cartier), first in the para standing girls event, and David Barber (Sudbury Secondary), second in the para standing boys race. 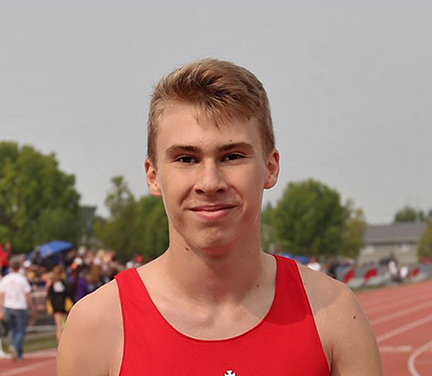 Track North Athletic Club's Logan Spicer competed at the Hershey Canadian Indoor Track and Field Championships in Montreal this weekend and returned with a gold medal, a fifth-place finish and a championship record. Spicer, a Lively native and the student at Lo-Ellen Park Secondary School, won his gold medal in the Under-18 high jump with a personal best leap of 1.95 metres. The mark was a championship meet record for his age category, and would also have placed him third in the under-20 category. Spicer also placed fifth in the 60m, with a personal best time of 7.24 in the heats and 7.27 in the finals.